Last month, I announced that I partnered up with Tria Beauty to try out their Skin Perfecting Blue Light for 8 weeks. I've been using the device for one month, twice a day for 2 1/2 minutes each session. I have to say I have noticed a difference in my skin tone. Not to the point that I walk by a mirror and say to myself "Self, you are glowing". It's more along the lines of not wearing as much face makeup. In fact, I have been skimping on my Lancome for 2 weeks now. I need to pick up a new bottle but I have gotten lazy about it as I do not rely as heavily on my foundation as I used to. During my first week, I used the device every night before I went to bed for 5 minutes. I then learned I could split it up my sessions to two 2 1/2 minutes a day. So easy! I do my first 2 1/2 minute session in the morning, while checking email and drinking my coffee. Then again before I go to bed. The Tria Blue Light is super simple to use, it turns on when it hits your face. 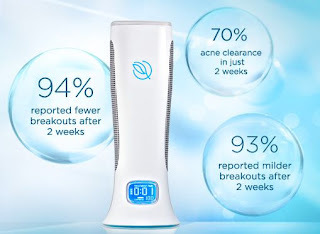 The Skin Perfecting Blue Light gently penetrates below the surface to eliminate the bacteria at the source. Tria's non-UV blue light interacts with the bacteria to cause the bacteria to self-destruct. 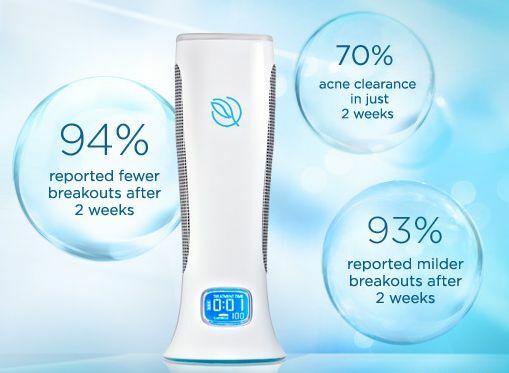 Eliminate the cause, and you not only clear existing blemishes but you also help prevent acne for consistently, clear skin. This method also brightens up your complexion, which is the results I have personally seen. Make sure you keep up with my journey as I will be giving a Tria Skin Perfecting Blue Light to one of my readers! This device is valued at $245 so you do not want to miss this opportunity. For more information on Tria and their other products, check them out online at www.triabeauty.com.